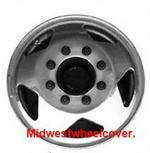 3335A, Used Rims FRONT, 16X6, 8 LUG, 170mm, 99, FORD, F350SD, DRW, 5 SLOT, ALLOY. 3340, Used Rims, 16X7, 8 LUG, 170MM, 00-05, FORD, EXCURSION, F-250 SD, F-350 SD, SRW, STEEL ROAD WHEEL, CONVENTIONAL SPARE, PAINTED 8 SLOT, GREY. 3603, Used Rims, 18X8, 8 LUG, 170 MM, 05-07, FORD, F-250SD, F-350SD, SRW, 5 GROOVED SPOKES, ALLOY. 3687, Used Rims, 18X8, 8 LUG, 170 MM, FORD, SRW TPMS, F250SD, F350SD, 06-09, 5 SPOKE STEEL SPARE.